The villa is situated on the Semaphore hill in the town of Sainte Maxime. It overlooks the hillsides and the golf course to the north and west of the town. The villa has 3 double bedrooms and can sleep 6 people (and a baby). It is situated in a beautiful, landscaped private domain which has its own tennis courts, swimming pool and boules pitch. 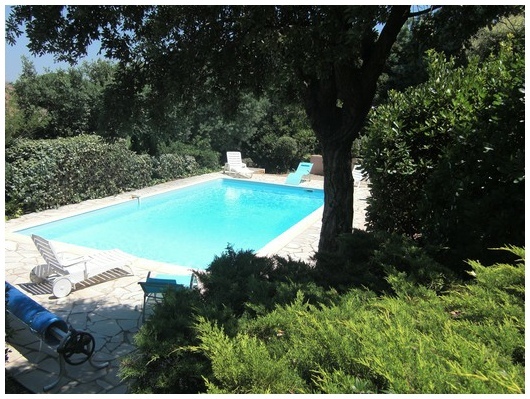 The villa has private parking for the use of guests and it has has its own private swimming pool in the rear garden. Although it feel as if it is located in the french countryside, the villa is just a few minutes drive away from the town centre of Sainte Maxime which has a wide range of shops, banks, bars and restaurants. It also has a sandy beach right in the town centre and other beautiful beaches both to the east and west of the town. The Semaphore villa has everything you need to have a fantastic holiday in the South of France.